There may be a few people here whose orienteering days go back far enough to the era of 'master maps'. Before course printing became readily available and affordable orienteers would start their competition by copying their course from a master map board on to their blank copy of the competition map. At major events the time taken to do this was part of the competition time. Sadly the use of master maps has pretty well disappeared from orienteering events and probably even from training. I say sadly because using master maps helped particularly new orienteers to read the map and relate the symbols to reality and to take care with detail. Placing the control circle one re-entrant over could be pretty costly in time if you were in Ohio ridge/valley terrain, I remember. Using master maps to copy courses is a bit like driving a car with standard transmission in North America. No one has to do it but we should learn to do it nonetheless. Are you still reading? So here is my request. 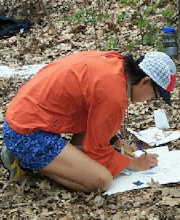 I'm preparing an orienteering coaching slide show for a few instructors and will be extolling the virtues of master maps -better learning, less waste -and would like to illustrate with a photo or two of orienteers using master maps. Could anyone find and send one or more to me? I'll be very grateful. Agreed. very good training exercise. A search of Google images resulted in only one I could find (third one on this page) which isn't quite what you're looking for but the captions are amusing. Maybe you'll need to recreate the activity and photograph it. I would agree that studying the map carefully as when copying a master map is a useful exercise and that's why the concept of the map copying relay is still used. That said I'm glad we dont have to do it as part of races anymore! LOL, they still do it these days for local events in the Deep South. A few weeks back in Charlotte, for example. QOC still did this until maybe 10 years ago, although it was not on the clock. I (SVO) used to run some Scout orienteering days where we had them copy their own maps for the first few years (also not on the clock). These galleries have some photos of them doing it, although it's not really clear what's going on unless you label it as such. Photos are all mine and you may use them if they work for you. Thanks all - Janet, Boris and Julie particularly. Well Janet I could not use that one but but you are correct that looking back at FLO in 2000 was amusing. Most of those guys putting on the NOD are still around and still doing the same tasks 18 years later. I agree with all that master maps and copying are well done from competitive orienteering. But here is the problem. I looked at the replay of over 100 Livelox tracking orienteers at a recent event. Most had very little orienteering experience and their tracks showed it. For these US youth the maps might have well been in Russian text instead of international symbols. They understood them about the same. Using master maps is just one way to bring new orienteers closer to map awareness in their practices. For their instructors the master map is also a much better method than drawing the course on one map and photocopying which is done by some and it is also a good alternative to printing extra maps that go to waste which is a concern for others. I'll use these photos to start but ghet my own when I run a session at a school in early December. Yurets copying from a master map while on the clock was standard procedure back in the 1960s and 70s. Some of the American oldtimers will remember an ROTC leader and event organizer named Jack Dyeus of Ohio University. He put on a lot of events and usually got things right but one time he underestimated the time that some entrants would need to copy the longer courses. A line up developed to use the master maps so he made a rule on the spot and enforced it. If someone was taking more than 3 minutes to copy their course they would be DQed and their map confiscated. Ah those were the days. Anyone want to start a thread of Dyeus stories? In England we quite often had second master maps - so rush in punch control, get map out of bag and head over map copying controls down with sweat pouring off one forehead onto the map. Now I don't miss that. I've done a lot of training exercises where I just brought blank maps and everyone copied the circles for the training exercise off of a master map. I agree it's a good training exercise, but not good in competition. At a training, the coach can check the map to make sure you've got the circles right before you go out. I don't want to deal with search and rescue for the competitor who doesn't even have the right circle on their map. There was lots of copying while on the clock when I started. It was the case for all meets except important ones (e.g. A-meets), which had preprinted maps, usually done tediously with a stamp-pad course printer. For local meets, this remained the case in most places as long as offset-printed maps were in use (DVOA being a notable exception). Once most maps were laser printed, it became easier for everybody (organizers as well as competitors) to print the course along with the map. As recently as a few years ago, the UNO Camping Weekend was still using offset-printed maps of Pawtuckaway, and the picnic tables in the pavilion were filled with people copying courses. And that was okay. But as far as I'm concerned, copying when the clock is running is not, and I campaigned against this for a long time. Those arguing the other point of view would bring up fairness, and that if people could take their time to copy the course, then they could plan out routes in advance. And I said so what. For any meet important enough for that to be a concern, preprinted maps should be used. Copying the course ahead of time before starting, at a local meet? Sure, nothing really wrong with that. But other than for a novelty event*, I don't ever want to see copying on the clock happen again. As for the "fairness" thing, these days at most local meets that I go to, preprinted maps are handed out at registration, and there's plenty of time to look them over before starting. Advanced competitors probably don't look, in order to get more practice for more serious events. And relative newcomers can preview what's ahead, which is a good thing (they may even have questions they can ask before starting). *I once put on a novelty event where you had to copy your map on the clock. Not just the course, but the whole map. I handed out blank sheets of paper and I had a box of crayons or markers or something. Each person could decide how much time it was worth spending to add detail. One person just wrote down a bunch of bearings. Used to have some photos - they were all pretty similar though: a row of bums up in the air! An added element of the second master maps in the UK, at least the year I was there, was that you had to carry your own pen/pencil to mark them. At least in Australia you didn't have to do that. Good story about copying the map on the plastic bag. Ha ha that race didn’t go well. It was not me! The AR folks would just hand you a list of UTM coordinates and make you plot them on your maps, sometimes on the clock. It was a skill to learn and practice before race day. I don't know if this is still common among ARs or not? I don't think I've ever plotted from a master map, but I could see some value for training purposes similar to a memory-O drill. Just another coaching tool to shake things up. Sounds like it's gone the way of typewriters and penmanship. Thats why I would argue master maps might be something you do in club-based training but shouldn't be something to do with beginners. Still plotting UTMs at one AR in Manitoba, but not at the another Manitoba AR. I don't miss master maps at all. Although theoretically good training for beginners, what happens in the not-too-unlikely instance where, due to their lack of familiarity with O maps and the sport in general, they get a circle in the wrong place? So if we want to use the exercise of putting control circles in the right places on maps as a training exercise, that would be fine, just don't combine that with sending them out on the course they just copied, unless someone experienced checks their work. From my (fading) memory of master maps, it was apparently very difficult for kids to draw a circle *around* an object, rather than start the circle *on* the object and thus circle some place near the control. Therefore, when laser printers came round, I started printing all-controls-maps, so people only had to connect the right controls, while still reducing printing overhead. I started O' with master maps, and I don't think it really helped me learn to read the map, especially as we were on time in our club. I certainly made some copying mistakes, and it was an acquired skill. Not very relevant to actually finding the controls in the woods. As meet director, I find pre printing maps, way more trouble and time consuming than making master maps. And a part of me cringes at the all the maps which get thrown away. The club has piles of them in the storage locker, but really, no one is ever going to use them....turning them into another use would be the best to hope for, but what? Can you print control descriptions on the backs of unused maps? QOC does that. Use them for some fun awards? Reuse them for a training course/event? Pinterest would be another place to search. An event we did this evening in Canberra reminded me of another event we did on the same map back in the master map era. On that occasion the start was next door to the Canberra Mosque and somebody set the master maps up so that everyone was facing Mecca. We had boatloads of large pre-printed rogaine maps left over after the North American championships. I took them to a small, local mailing service and had the service cut them to various sizes and turn them into "pads of paper" for stationery. I have used some of the pads for gifts (to other orienteers) and send notes or keep "to do" lists on others. (They are superb for thank you notes to event volunteers!) Total cost for about as many maps as I could carry: five dollars.